This lovely shawl, reminiscent of birds flying in their great formations to warmer lands, will give you just a smidge of luxurious warmth to carry you through the blustery winter into the sunnier days of spring. Use 2 skeins of Michaels Loops and Threads Woolike or @ 1,000 yds similar weight yarn. Two different edging options are available. 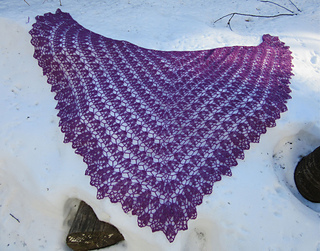 Sample with edging #1 is 72 “ across X 34 “ deep, but the instructions include information for adjusting the size of the shawl. Sample with edging #2 is 57” across X 29” from neck to tip, but the instructions include information for adjusting the size of the shawl.